A few months back I swapped one of my cashmere hats for a few hours of practice time in a hard-to-get-in facility. It was a great deal for me, because I was bored of that hat anyway and needed an excuse to knit myself a new hat. I wanted something that would be ridiculously warm in the dead of winter. 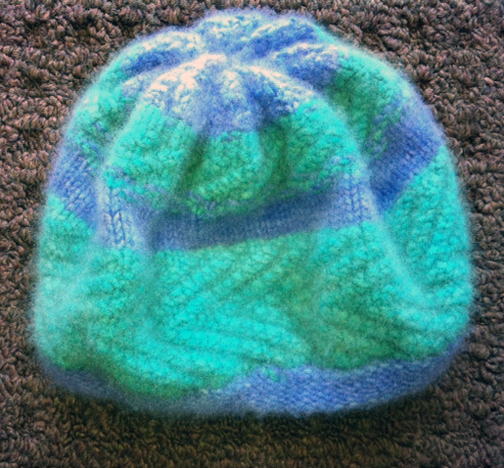 I had fun with green and purple-blue cashmere; I made a zig-zag rib; I made stripes; I finished the hat and then cast on a new bottom band to make it nice and snug around the ears; finally, I felted it within an inch of its life by washing it and putting it in the dryer for half an hour. It’s soft and dense and fits nice and snugly. This entry was posted in knitting on July 5, 2011 by Diana.